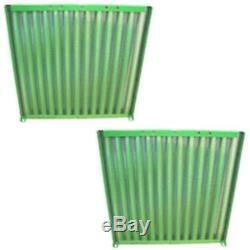 Two New Aftermarket Replacement Side Screens for John Deere Tractor Models; 4040, 4230. 21" x 24" USA Made. Fits Left or Right side. Only the 48 contiguous States in the U. The item "Pair Grill Side Screens For John Deere 4040 4230 AR65459" is in sale since Tuesday, August 15, 2017. This item is in the category "Business & Industrial\Heavy Equipment Parts & Accs\Tractor Parts". The seller is "stevenslake" and is located in Williamston, Michigan. This item can be shipped worldwide.